Fu Wenzheng grew up in a temple in China where her grandfather was a monk. The experiences she had as a child have greatly influenced her writing and style of illustration. Traditional Chinese culture and philosophy are at the focal point of all her work. Fu Wenzheng did her undergraduate studies at Fujian University’s College of Fine Art and then went on to study Illustration at Zhejiang Science and Engineering University’s School of Art and Design. Although Fu Wenzheng is new to the UK and Australia she is already well respected and known in China. 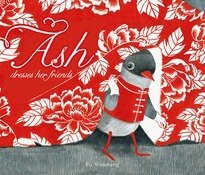 She has received a number of national and international awards for her work including the excellent illustrator award in The 2nd CCBF (China Shanghai International Children’s Book Fair). As well as writing and illustrating picture books, shealso teaches in the Cultural Products Department at Fujian Normal University’s Union College.